Written in elegiac prose, Lepore's groundbreaking investigation places truth itself--a devotion to facts, proof, and evidence--at the center of the nation's history. The American experiment rests on three ideas--"these truths," Jefferson called them--political equality, natural rights, and the sovereignty of the people. And it rests, too, on a fearless dedication to inquiry, Lepore argues, because self-government depends on it. But has the nation, and democracy itself, delivered on that promise? 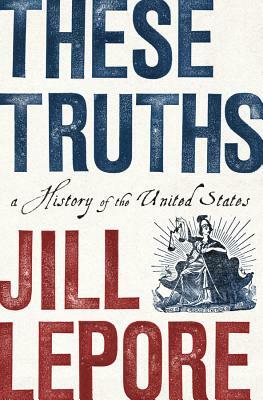 These Truths tells this uniquely American story, beginning in 1492, asking whether the course of events over more than five centuries has proven the nation's truths, or belied them. To answer that question, Lepore traces the intertwined histories of American politics, law, journalism, and technology, from the colonial town meeting to the nineteenth-century party machine, from talk radio to twenty-first-century Internet polls, from Magna Carta to the Patriot Act, from the printing press to Facebook News. Along the way, Lepore's sovereign chronicle is filled with arresting sketches of both well-known and lesser-known Americans, from a parade of presidents and a rogues' gallery of political mischief makers to the intrepid leaders of protest movements, including Frederick Douglass, the famed abolitionist orator; William Jennings Bryan, the three-time presidential candidate and ultimately tragic populist; Pauli Murray, the visionary civil rights strategist; and Phyllis Schlafly, the uncredited architect of modern conservatism. Americans are descended from slaves and slave owners, from conquerors and the conquered, from immigrants and from people who have fought to end immigration. "A nation born in contradiction will fight forever over the meaning of its history," Lepore writes, but engaging in that struggle by studying the past is part of the work of citizenship. "The past is an inheritance, a gift and a burden," These Truths observes. "It can't be shirked. There's nothing for it but to get to know it."